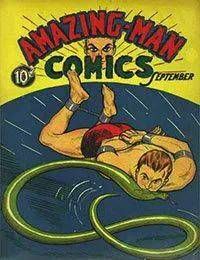 Published from September 1939 to January 1942 with 22 total issues (#5 - #26).<br />Amazing-Man (John Aman) is a fictional, American comic book superhero whose adventures were published by Centaur Publications during the 1930s to 1940s in the Golden Age of Comic Books. Historians credit his creation to to Everett together with Centaur art director Lloyd Jacquet. The character influenced the creation and origin of Charlton Comics 1960s superhero Peter Cannon, Thunderbolt, as well as Marvel Comics Iron Fist character in the 1970s.